So many booths, so many dreams! Imagine the world’s largest Whole Foods on a Friday evening…plus sales reps…and speed dating. 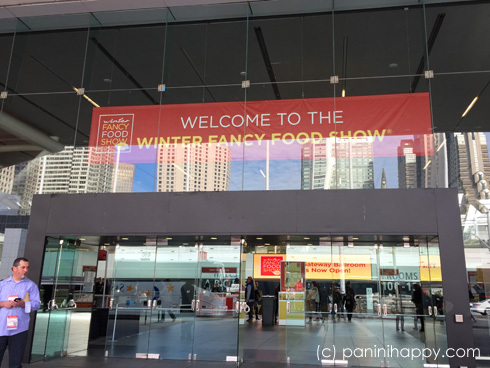 At the Winter Fancy Food Show in San Francisco on Monday, I was overwhelmed — dizzied, even — by the sheer volume of specialty food products and people looking to buy, sell, package and promote them. 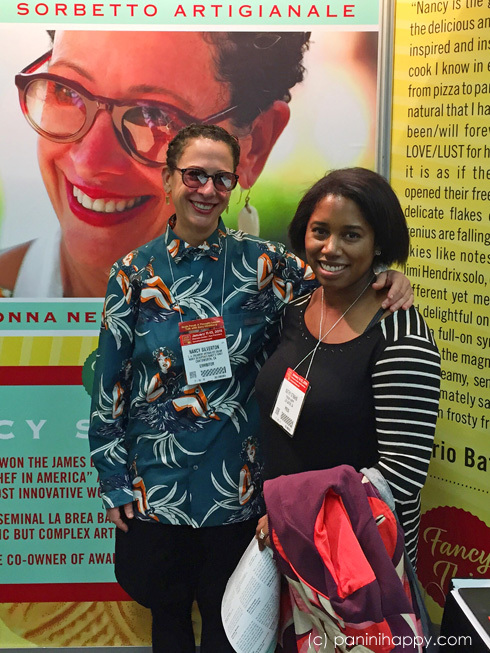 Meeting Nancy Silverton (see above) was definitely a highlight of the show for me. I’ve long admired her success as a chef and businesswoman and was extra proud to let her know that I used La Brea Bakery bread throughout much of The Ultimate Panini Press Cookbook. She actually was at the show to debut a new venture: gelato! I had the chance to try out four flavors of Nancy’s Fancy — my favorite was the Coconut Stracciatella with Bittersweet Chocolate Strands, which is actually a dairy-free sorbetto. The coconut flavor, from coconut milk, was so pronounced and refreshing! Nancy’s Fancy shared a booth with L.A. Creamery, which had one of the most decadent treats I have dared to taste in recent memory: salted caramel cheesecake sandwiched between two cinnamon-sugar dusted sugar cookies, aka Cheesecake Sammies. Ohhhh my goodness. I took three bites (ok, big bites) of this insanely delightful sandwich before I had to move it away from my own reach. I still had a lot of tasting to do! It might have been easier if I’d had a specific objective or agenda for navigating the 1,400+ exhibitors, but I didn’t. Lugging my trench coat and two bags up and down the halls (my arms were searing the next day! ), I mostly was just looking for products that interested me — something I hadn’t seen before. A few things that caught my eye: birch syrup (along the lines of maple syrup, but from birch trees), edible play doh (when you’re done playing you can bake the dough into “cookies”), extra-dark Vosges chocolate with mushrooms in it (couldn’t taste them…thankfully) and authentic Black Forest ham from Germany (not at all like the deli stuff — drier, more like speck or prosciutto). The woman offering the ham samples had big red pompoms covering her hat. Gotta get noticed at this show! Another proud moment at the show — and I wish we’d taken a photo! — was getting to stop by the booth of my friend, Heather Scholten, whose spice products are really taking off. Heather and her business partner Pete started Spiceologist in 2013. I use their Pink Peppercorn Lemon Thyme rub (which I bought at Sur La Table) pretty much every time I roast chicken — my family loves it! 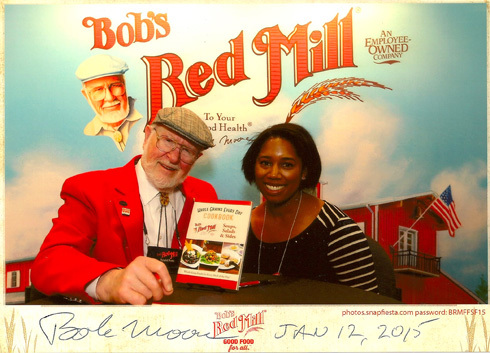 Last, but not least, I had the chance to meet Bob Moore from Bob’s Red Mill — I recognized him immediately, his face is all over my pantry! He’s a friendly fellow, and I like his company. I told him I’d become interested in beans lately. One of the company reps showed me their new orca beans which I thought were so pretty — they’re black and white, like the whale. Pretty beans? This is who I have become. In terms of trends — it’ll probably be a little easier for me to discern them next year, now that I’ll have a show to compare with. But in general, I couldn’t help notice I didn’t see a huge push for bacon-related products, which I imagine were all over the halls in previous years. Maybe we’ve seen a peak on that? Who knows. What I did see come up often was peanut butter, in a variety of forms: powdered (to add into smoothies, or to make a lower-fat peanut butter “paste” with water), and drinkable peanut butter (think hot chocolate) stood out to me, in particular. All fascinating stuff! A Sandwich Party for the Teachers + Giveaway! I wasn’t even aware of this show until I saw you and Heather Istagramming it. And not one of the Sacramento bloggers were there to represent…how is that?? Wish I could have gone. Guaranteed, one of the highlights would have been meeting you. This looks so fun!!! There is one this summer in NYC about a mile from my apt that I’m hoping to go to. Loved your recap! It’ll be worth it, Joanne! Fascinating to see what people are up to (or about to be up to) in food. So fun, I have wanted to go to this ever since I first heard about it back in about 2006! Such a fun post! The show sounds great. Drinkable peanut butter? Edible play doh? Yes, please, and Yes, please! Looks like a lot of fun! I am jealous! It looks like you had such a blast, Kathy! I’ve always wanted to go to the Fancy Food Show. Thanks for the inside scoop!